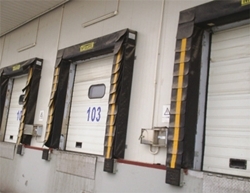 Dock Shelter (Sealing) - pillow Type Adapt to The Truck of Uniform and Higher Sealing Request. 1.0 mm Imported High Density Polyester Fiber With Yellow Guide strip, Filled With High-Quality Sponge. Yellow Scale Strip (Drape) , to Increase Rubbing and Sealing Effect, Protect The Sealing Column. Additional Top Curtain (Height 600 - 800 mm), Adapt to Small Truck. Copyrights © 2016 Aka-Systems (Thailand) Co., Ltd. All Rights reserved.